This post was sponsored by Comfortiva. When I returned to Denver one of the first things I did was check out a local record store for my grandmother’s favorite artist. When we were playing records at her house she had mentioned that her record was scratched and wished she could get a new one. I really felt like fate was on my side because the very first record store had her favorite album in pristine condition and there was only ONE copy in the entire store. The man at the counter commented how lucky I was and how he couldn't believe that I found it so quickly. I just stood there beaming at him because I knew that it was meant to be and that someone was watching out for my grandmother. 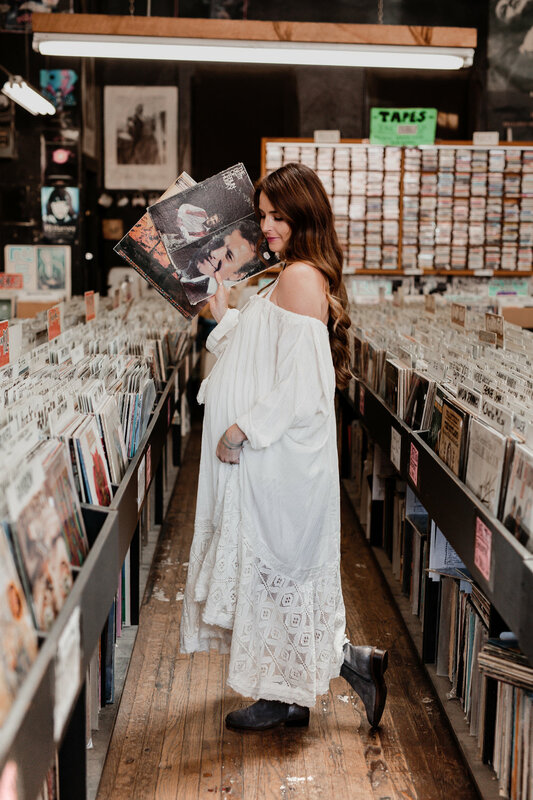 Throughout my time at the record store I felt a sense of surrender and peace. It’s hard to explain, but even though Kyla the photographer was there (we had planned to go to the park to shoot these amazing Carrie boots from Comfortiva), I didn’t even notice her taking photos. I was locked into the history of the records and thinking about my grandmother and what it was going to be like once the baby in my belly could meet my grandma. As you may know, I have a pretty strong mindfulness practice. And as silly as it seems, I am really glad I wore these specific boots to the record store. They have a metallic shimmer to them and the light kept hitting them while I was walking around the store. The reflection just added to the magic and made me love these boots even more. Not only do these boots shimmer, but they also feature multiple footbed technologies- creating comfort in every step. Comfortiva is one of my favorite shoe brands and these boots, like all my other shoes from them, did not disappoint on the comfort level. These boots come in various colors: light grey bronze, black suede, and steel grey. I am wearing them in steel grey. And if I think they are comfortable wearing them throughout my third trimester, I can’t image how comfortable they will be once I am not lugging around an extra 30+ pounds (wink!). Get your Carrie boots here!